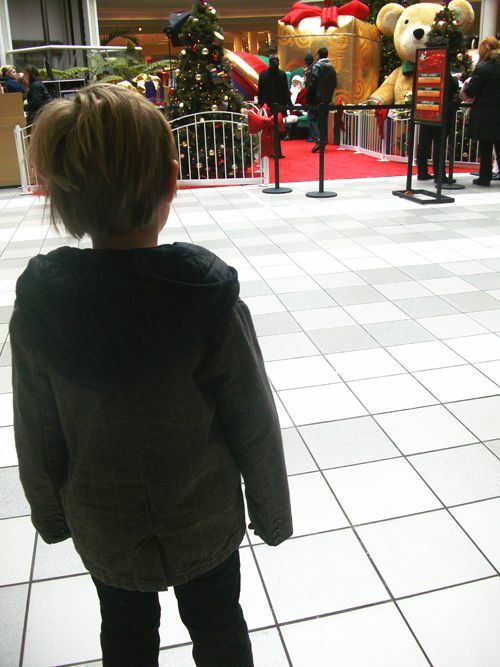 max and i spent his first day of christmas break loitering at the mall...eating ridiculous portions of pizza, visiting the puppies, doing a little people watching (snickering at the people getting the free massages), and lurking santa. so instead of sitting on his lap like we intended to do when we got there, max decide he wanted to just "see" him. observe him from afar. size him up. this is as close as he got. and although it's a little less traditional than other "kids with santa" pictures, i still want to stuff this one in a christmas card. is it me or are his fists clinched a little....? once we got that over with, we realized stalking has a way of making you hungry...so we sat up in the food court where max repeatedly hid under the table when pretty girls walked by and continued his watch on santa...this time from the balcony. my guy is a hoot to be around in public these days. he's all befuddled and turned about and plotting against iconic jolly men. christmas count down: 4 days! ack. Oh my stars. The image of Max cautiously eyeing Santa from afar is so precious! It's one of those moments that is so much better than any "Kiddo and Santa" photo ever could have been. he is so adorable actually the both of you are! i always thought that santa at the mall was a bit creepy...your little guy was probably right about just seeing him from afar. I agree with Max. Mall Santas are creepy. One stopped to talk to my boys once and they both just gaped at him, too scared to speak. oh my goodness, he is hilarious. 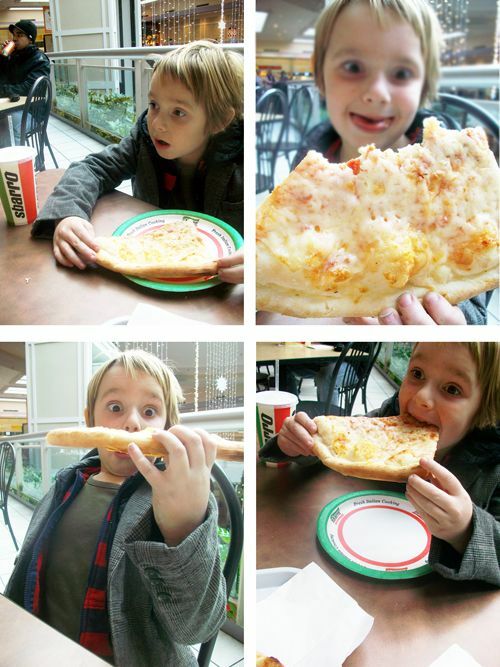 those pizza photos! 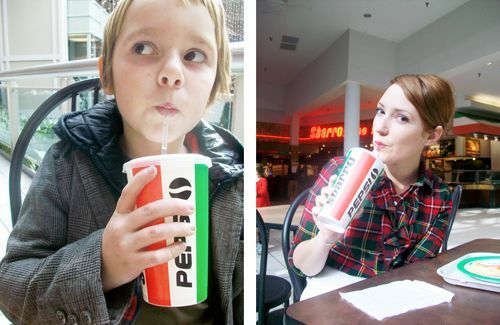 I think it's a legal requirement for every mall to have a Sbarro's. Is it bad that I kind of wish my kid was afraid of Santa? I think it would be a hoot to have a picture of her freaking out on Santa's lap, instead every picture is of her freaking out with joy. She looooooves Santa (she's four). That is by far the greatest Santa/child photo I've ever seen. Max is totally justified though, Santa is kind of a creeper.